Marlon Brando did something courageous and shocking in 1973 by refusing the National Academy’s award for best actor, for his portrayal of Don Corleone in The Godfather. Social commentators and Hollywood insiders considered the move ingenious in a manner Brando “probably didn’t intend” at the time. Such a move was simply not done in the America of 1973. It had ramifications beyond Hollywood. It shocked the nation. It was considered the major event of its time in Hollywood, in America, and it was fodder for a Gene Siskel conversation on the glory of Hollywood’s bygone era decades later. Everyone was talking about Marlon Brando. Brando’s refusal of the award was immediately considered one of the most altruistic acts of all time, as he did it to protest the U.S. treatment of the Native American, and he was all but sainted by those obsessed with the idea of celebrity. In lieu of all those that have subsequently been influenced by this move, however, we must reconsider if that move was an altruistic one, or if it was one of the first, best marketing moves of all time. It’s impossible to know if Brando’s refusal was entirely borne of narcissism, but it should be noted that his rejection of the award was the second time it had been done in four years (George C. Scott rejected his best actor award in 1970). Scott’s rejection, however, had more to do with the silly act of actors (artists) competing with one another for a prize than it did any altruistic reasons. It could be said, then, that Brando was trying to top Scott in the public relations department, because Scott made his refusal of the award less about him. Brando’s refusal of the award could be said to be generally altruistic in nature, but it could also be said to be historically self-indulgent. This statement that Brando purported to make that “everyone should look at everyone but me,” could be said to have attained the greatest “look at me” status ever achieved in an award acceptance speech. It could also be said to have given birth to the “courageous acts of geniuses that do something shocking” industry. Prior to Brando’s refusal, it was accepted practice that every star who won engaged in the time-honored tradition of humility by giving a “no man is an island” themed acceptance speech. Humility still has a place in Hollywood, as it does in the rest of America, but more and more individuals are asking if it pays dividends equivalent to those strategically placed acts of self-promotion. The “courageous acts of geniuses that do something shocking” industry that Brando had a hand in creating is now populated by public relations specialists looking to keep their stars in the news in the manner Marlon Brando’s act of defiance did. The public relations specialists have their clients say controversial things that a lot of people are saying, but only the stars have the courage to say publicly, and they get them to do things that everyone is doing, but no one does publicly, to attain “shocking” status. “Shocking” status has become a vital tool to those stars that are otherwise untalented; shocking status can elevate a talent among the equally talented; and it can give birth to an otherwise fledgling career. Those stars are hanging onto their careers by a thread, but the public relations departments instruct them to select a thread that is not so abundant that it covers the organ, or the gland, that they’ll need to expose if they want another minute punched onto their fifteen minutes of fame time card. If that doesn’t work, the public relations department will release the star’s adult movie that was “never supposed to be seen”, and they may have them say something political that is clipped short enough to conceal the fact that the star knows nothing about politics. They climb atop one another, in this game of king of the mountain, with all of their shocking acts of courage and genius until we reach a point where if Brando did what he did in 1973, today, we would probably all be yawning with fatigue. Most rational people would confess that much of what Madonna does is silly and stupid, but they conclude this critique with the idea that she is brilliant at self-promotion and marketing. Carving away all of the ancillary and colorful details of her acts and statements, we find a narcissistic, self-indulgent individual that knows how to thrive in the prevailing winds of the music industry. She adopts the “look at me” meme in her act in order to keep people talking about her. When she hires dancers who flip off the audience, we talk about the act and the apology that follows, but most importantly we talk about her. There are advisers and marketers devoted to getting stars to do that one thing that you consider so courageously shocking that you wouldn’t do in a million years, but they have the “courage” to do in public, so you’ll talk about them. As they say, there’s no such thing as bad publicity as long as your name is spelled correctly. Streaking, and revealing your body parts to children, used to be an act reserved for “criminally” desperate individuals looking to shock people for their self-indulgent satisfaction, until Janet Jackson did it in a Super Bowl halftime show. It was an ingenious, marketing move when she did it. It prolonged her spotlight a little longer. How many people would’ve done this for a little taste of fame? How about for a bunch of money? Cynical purists would say that I would do it all for just one day of Janet Jackson’s fame, and if I say I wouldn’t I’m lying. Yet, if we were to sit down with such an act and consider the long-term ramifications of it, how many of us would want that legacy? How many of us would want cynical America to attach such an incident to our name for the rest of time? How many of us think that was a bold and courageous move of something shocking, and how many of us think that, in hindsight, that it was a desperate move, by a desperate woman, hoping to eek out a couple more minutes on her fifteen minutes of fame timecard? The talking heads on entertainment television, cable news, blogs, etc., have conditioned us to believe that it was a genius move. They have led us to believe that it was courageous in its shocking disregard for the rules of a puritanical society, and she should be celebrated for the genius idea that we’re still talking about years later. Celebrated? Genius move? She showed a breast. She appealed to base, prurient instincts. She did nothing that promoted greater thought. She did nothing that required unique artistry. She showed us one of her breasts. The talking heads are usually conflicted between the ideas that it was an insignificant breast that no one should get upset about, and the idea that it was a bold and shocking move to display it. No adult, I would guess was extraordinarily moved by it, but I’m guessing that there were a lot of kids that were. There were a lot of kids that we used to believe were criminally affected by adults flashing them that are now told to grow up … it’s just a little breast. Who is ingenious, what is ingenious, and what does one have to do today to be considered ingenious? An individual that slashes social mores today, is considered to be one of the ingenious provocateurs of tomorrow. An individual that speaks out against the median interests of the American public is now thought of as a shocking provocateur, but if everyone is playing this same king of the mountain game is there any room left for shock on this avenue? The talking heads usually offer conflicting and arbitrary adjectives to those that provide the market provocative marketing and those that appear foolish for overdoing it in some fashion. No one, it seems, can figure out a precise formula for what works and what doesn’t, and more and more are caring less and less. When Marlon Brando refused to accept his award for best actor one of the aspects of stardom that he may have incidentally demolished was: humility. The idea that no man was an island was captured in the acceptance speeches of actors and athletes the world around prior to Brando. It was such a standard that it became fodder for comedians, that an actor would thank everyone from their mother, to their acting coach, to the Dolby grip boy who stood on set during the filming of that particular movie that won the actor the award. 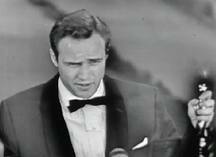 In Brando’s “acceptance” speech that the Native American delivered to the world on that evening in 1973, Marlon Brando managed to call more attention to Marlon Brando than any actor had been able to achieve in any other acceptance speech given prior to that one. He did something courageous, something shocking, and something historic, and everyone was looking at Marlon Brando, talking about him, and mentioning his moment for the rest of time. The cynical part of us suggests that Brando’s actions were ingenious in the aspect that it kept his name in the news, and in that vein it proved to be something so narcissistic as to influence the generations that followed. At that point in history, it just wasn’t done. It’s now done all the time.